We’re back from a week on the Mornington Peninsula. All that beach-going and relaxation was rather nice; although I did manage to scorch a large hot pink triangle on my chest region (after forgetting the sun screen on that one darn spot). The 7 year old said it made me look like a super hero. The 4 year old required a trip to hospital after being stung by a bee on his foot, which blew up like a balloon. He consequently spent most of his beach days being dragged around in a blow-up boat. So… we’re home and exhausted. Time for an easy recipe methinks. Hello No-stir chicken and roast pumpkin risotto. A mum from my son’s school (hi Gab!) got me hip to the no-stir method. Risotto purists should avert their gaze. Instead of ladling incremental amounts of hot stock, and stirring and checking every 5 minutes; you can be grating the Parmesan and chopping the parsley while it practically cooks itself. Excellent! Reserve some of the risotto as planned-overs (look for the ♦ orange diamonds within the recipe) and whip up a batch of scrumptious Crispy risotto balls the next day. PS. Had to share my beautiful vintage happy flower fabric, a pressie from my friend Meagan. 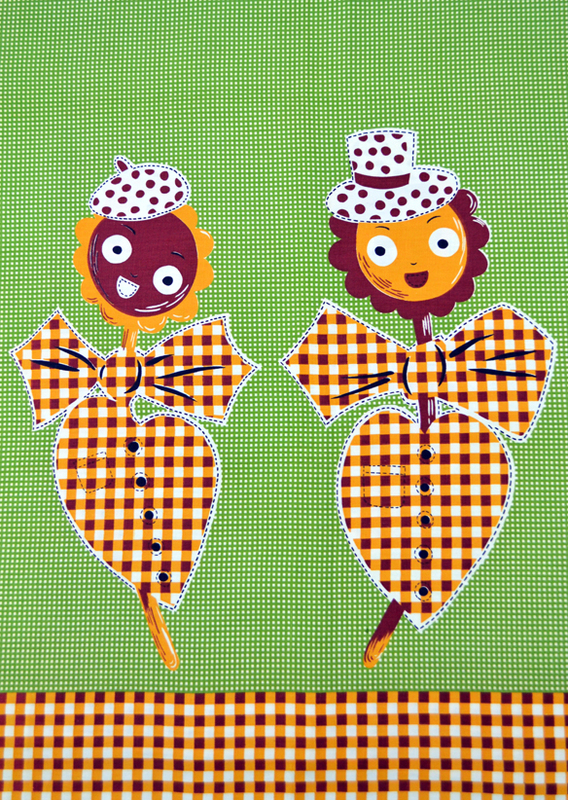 One day it will become an apron or skirt, but for now it makes a spiffy tablecloth! Preheat oven to 200°C (390ºF). Toss the pumpkin cubes in 1 tablespoon olive oil and roast for 20–25 minutes until cooked through. Set aside. Meanwhile, heat the extra olive oil in a large saucepan and fry the chicken and onion over a medium heat for 5 minutes, until onion is soft and chicken is cooked through. Add the rice and garlic and continue cooking, stirring frequently, for 2–3 minutes. Add the corn kernels and 4 cups of stock. Stir once, cover, and bring to the boil. Reduce heat and simmer for 10 minutes until stock is absorbed. Sneak a peek after 8 minutes, to make sure it isn’t sticking. Add peas and remaining stock. Return to the boil and simmer, covered, for a further 10 minutes. Gently stir through the roast pumpkin, Parmesan and parsley. Season well with salt and pepper. ♦ Reserve 5 cups (about 1.2 kilos) chicken and roast pumpkin risotto for the crispy risotto balls. Serve risotto, scattered with extra parsley. Planned-overs (reserved risotto) can be stored in the fridge for up to 3 days. Fresh peas can be used, instead of frozen. Add these with the corn kernels. Roast some extra pumpkin with a couple of quartered red onions and you’ll have an instant salad for dinner (or lunch) tomorrow. Toss with a balsamic vinegar and olive oil dressing; and scatter with cracked black pepper and basil leaves. Freeze leftover parsley stalks, and use in sweet tomato pasta sauce or home-made chicken stock. 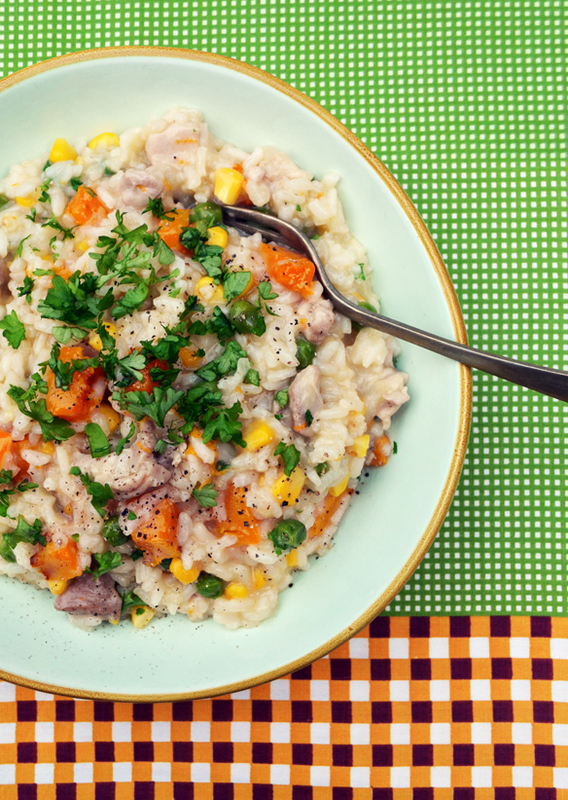 ♦ Place reserved chicken and roast pumpkin risotto into a large bowl. Break up risotto roughly with a knife, add ¾ cup breadcrumbs and mix thoroughly. Shape mixture into about 25–30 golfball-sized balls. Dip into beaten egg; then lightly roll in the extra breadcrumbs. Refrigerate up to 4 hours, until required. Heat oil in a deep frying pan until shimmering. 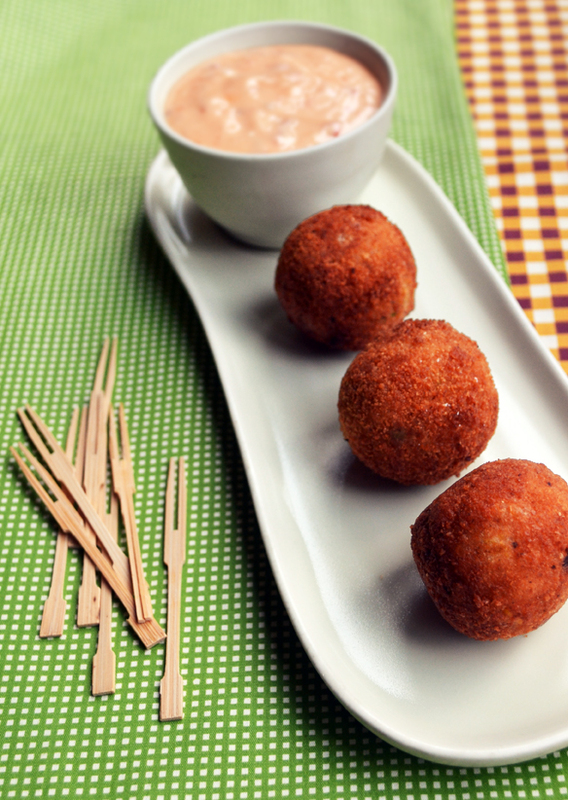 Fry risotto balls in 3–4 batches until crisp and golden, about 4 minutes. Roll the balls around in the oil with a slotted spoon or tongs, to ensure they brown evenly. Drain on paper towel. Sprinkle with salt, and serve hot with chilli mayo or sriracha mayo, and a simple green salad. Yum. You’ll need sriracha chili sauce for sriracha mayo, which is available at Asian food stores. The authentic version, made by Huy Fong Foods in California, is available in Australia at USA Foods. This entry was posted in CHICKEN & DUCK, FRITTERS/PATTIES & BALLS, PASTA & RICE and tagged bread crumbs, leftover risotto, leftovers, no-stir risotto, planned-overs, risotto, risotto balls by Saskia (1=2). Bookmark the permalink. I have been making many things from your blog recently and it’s making my days working from home a lot smoother in the evenings. The risotto was delicious last night but I have a question about the risotto balls. I’ve made more than we will eat tonight and I wonder if I can freeze them? Hi Georgia. Thanks for your great comment, and sorry for the late reply! I freeze leftover risotto often, defrost it in the fridge overnight and roll it into balls the following day. With defrosted risotto I add a handful more breadcrumbs as the mixture is quite wet. So, in summary, I think you could freeze the uncooked balls (if you’ve already rolled them) then defrost overnight. I’d suggest rolling them in a fresh, quite thick layer of crumbs before frying. Good luck! Two things I like to do and/or enjoy: 1. laying on a sunny beach and 2. having one of these 1=2 meals. Looks deliceous……..call on me and I’ll be there, some day. Thanks Uncle Eli. You’re welcome any day! Thanks Marijke. Let me know how they turn out for you. Wonderful way to make risotto – how delicious. I can’t bare standing over a stove stirring away. I will try tomorrow. I’m a great fan of your new blog and will be following you in the kitchen closely. Thanks so much lovely Judy! Hope you like the risotto. We’re having it (again) tomorrow too. © One Equals Two 2015. All rights reserved. All recipes, illustrations and photos (unless otherwise noted) are created by me. Please don’t pilfer my stuff! Excerpts may of course be re-blogged or pinned, provided that full credit is given to One Equals Two with a specific link to the original content. Cheers.